Many Navajo chapters have the look of places that have seen better days. Pueblo Pintado's best days may have been around 1000 A.D. The 10-year-old Tsé Yi' Gai High School and the even newer, LEED-certified community school are impressive, much-needed structures. But they pale in comparison to the Chacoan great house that sternly observes them from a nearby hill. From a distance, the ruin of Pueblo Pintado ("Painted Village" in Spanish) has a monolithic, Stone Henge-like quality. Upon closer inspection, you can see it was a huge, three-story complex of square rooms and round kivas, beautifully built of large and small sandstone slabs. According to the plaque erected at the structure by the National Park Service, which oversees the site as part of Chaco Culture National Historic Park, Pueblo Pintado may have been both a gathering place for local communities and a station for travelers from the east trekking to the astounding ceremonial center of Chaco Canyon, some 17 miles away. It takes a good half-hour to explore Pueblo Pintado's ruin. Nobody else is there on this Monday, and the only tracks in the snow are those of rabbits and deer mice. The old walls, so meticulously crafted they would make a modern mason flush with envy, are eerily silent. You can easily picture a line of prehistoric priests, festooned in handwoven togas and bright feathers, solemnly making their way to the great kiva in the center. How is this place not a major tourist attraction? Partly, said Pueblo Pintado native Theresa Blackbird, because people don't want it to be. According to Blackbird, there's a sizeable minority of elderly residents who, citing Navajo taboos against disturbing Anasazi ruins, don't believe the site should be exploited. In Blackbird's family, you didn't even talk about the ruins. Name: Spanish for "Painted Village," it refers to the ruin of a spectacular Chacoan great house that perches on a hill above the modern community. In Navajo, the area is called Nahodeeshgiizh ch'’n’li, "Flowing out from the Gap," referring to the Chaco Wash. The ridge above the town is called Tsé Yi' Gai, "White Streak Rock," and lends its name to the high school. "I would come back from a walk in the canyon and say, 'Mom, guess what I found?'" the 50-something recalled. "My mom would go, 'Ahh! Shh! Shh! We don't talk about that place!'" So the modern town of Pueblo Pintado, which by all rights should be the gateway to Chaco, is instead a sleepy bedroom community for places far away. Grants is 50 miles hence, Crownpoint 43, and Albuquerque is a two-hour drive on a good day, yet those are the places Pueblo Pintado people work if they can't find a job at the schools or the clinic. Blackbird is getting ready to drop off her son to meet his carpool to work at the Apache Nugget Casino, a 74-mile trip. He gets home at 1:15 a.m., and Blackbird picks him up at Tinian Baptist Mission, drives home and gets a few hours of sleep before reporting to her own job in the dorm of the community school at 6 a.m. That's just how it is here. "It seems like we're always running off to some place or other," she sighs. Even to get gasoline, it's a 40-mile round trip to Torreon. "By the time you get back from buying gas," Blackbird observes wryly, "your tank is already half empty." A few years ago, Pueblo Pintado had its own convenience store with gas pumps, but the Anglo traders who ran it, Dennis and Brenda Buckman, got fed up with doing business on trust land and bought the Chaco Wash, a cleverly named Laundromat nine miles down the road. It's Pueblo Pintado's only private business. "(The store) needed a lot of improvements, and we couldn't get the bank to loan us money since we didn't own the land," Dennis Buckman explained. This is checkerboard country, and Chaco Wash is on deeded land. "At least now the bank will give us a loan," Buckman said. Navajo Oil and Gas, meanwhile, took over the convenience store and remodeled it. They had a nice grand opening on June 25, Blackbird recalled, but the store has yet to actually open. "Tell them thanks for the nice shindig, but when are we going to see our store?" Blackbird instructed the reporter. Soon, promised Lynette Willie, public and government relations manager for Navajo Oil and Gas. The couple who was going to run the store ran up against the same trouble the Buckmans had — they didn't qualify for a loan. "We tried selling it," Willie said, but couldn't find a buyer. "We're working on something now that should work out," she said. "We should have some good news very soon. We want the community of Pueblo Pintado to have gas for their cars." In the meantime, Pueblo Pintado is used to doing without. Since the Chacoans cleared out, this has always been a poor, remote community. In fact, until the 1930s or so, you couldn't really call it a community. It was more a place people passed through. "The people here were very nomadic," Blackbird explained. "My mother used to talk about going out in their wagons to Star Lake, Ojo Encino, even as far as NAPI. She said nobody cared then where you camped. You would just set up your wagons wherever, and build a fire." Then, when Blackbird's mother, now in her late 70s, was a little girl, the missionaries arrived. "I don't know what denomination they were, but they seemed to be from the South," Blackbird said. "I remember my mother talking about a Black woman who missed Southern cooking." The missionaries set up a school, and parents, anxious for their children to get an education, built permanent homes nearby. The mission school was replaced by a BIA school in the 1960s, and Blackbird's generation thought they had hit the big time. "That gym seemed so huge to us," she recalled with a chuckle. "In reality, it was tiny. If the kids today saw it, they would laugh." A replacement school was built a few years ago, managing to attain the LEED gold standard — the highest level of green-building. Until 2004, when Tsé Yi' Gai High School was built, Pueblo Pintado teens were bused to Cuba or Crownpoint for school — an hour's ride in either direction. Some parents, like Blackbird's, opted to enroll their children in the Mormon Church's Indian Placement Program, where they would live with an LDS family off the reservation and attend school in that community. Blackbird was sent to Hyrum in northern Utah's Cache Valley. It wasn't a big town, but compared to Pueblo Pintado, it was another planet. "I would wake up at night, look around and think, 'Where am I?'" Blackbird recalled. She has no regrets: her Anglo foster mom taught her to sew and she learned how to get along in mainstream society — "but I'm glad the high school is here now," she said. "I'm glad kids don't have to be sent away any more." Tsé Yi' Gai is one of New Mexico's tiniest high schools, with a studentbody of 117, but Blackbird expects it to grow as Pueblo Pintado develops. The Cutter Lateral of the Navajo-Gallup Pipeline is expected to arrive here in 2015, bringing running water to isolated residents. If the chapter is smart, said Blackbird, it will start planning some new homes now. "The young people are saying they want homes," she said. "They'll move back here if they have a place to come." 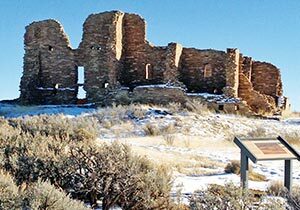 On and off, there's talk of paving the road to Chaco Canyon, which would route a lot more tourists through Pueblo Pintado and also help people get to their homes. They do get a few tourists already, but they're usually lost. "One guy came through pulling a boat," Blackbird recalled. He had seen a place called "Seven Lakes" on a map, and wondered how to get there. "Seven Lakes is just a bunch of little ponds," Blackbird said. "We just laughed." If this community is smart, however, it might stop laughing at the tourists and think about setting up a bed and breakfast for them. If the road is ever paved, Blackbird might make regular visits to Chaco herself. She doesn't hold much stock in the old taboos. "I love the ruins," she confessed. "I love to think about the Anasazi. I walk around in the canyon and I think, 'How did they live out here? How did they haul these big rocks? How did they make them so square? "When I die, I'm going to ask the Big Guy, 'Could you please rewind back to that time? I'd really like to see it.'"